These specification sheets provide a set of characteristics and information used to define and summarize the vine variety along with its major characteristics. The variety is presented uses the name listed in the official French Catalogue, which is generally the most widespread used name in French wine-growing. Varieties are presented in alphabetical order. 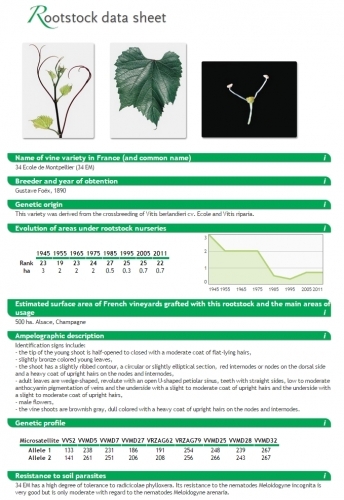 These information sheets provide an overview of characteristics and information used to define the vine variety and its principle characteristics. The 30 recommended rootstock varieties listed in the national catalogue are presented in alphabetical order of breeders or selectors with their usual name. Varieties of rootstocks are presented in alphanumerical order. Information listed in these sections is voluntarily expressed in terms of potential. In addition, each clone is presented with regard to the population of other clones and with regard to the general characteristics of this variety or vine variety. No figures are given. Precise information of yield, alcohol degree or regarding polyphenol indexes are in fact, are only significant for a given geographic area using specified cultivation practices. For each variety, the list of clones is presented in chronological accreditation order. The objective of the present note is to provide the regulatory, community and national overview of the Catalogue dedicated to vines. The "Official Catalogue of Vine Varieties" of which the material for vegetative propagation can be marketed is registered in the Code Rural (article R661-28) and is within the jurisdiction of the minister in charge of agriculture. The Code Rural specifies that the Catalogue includes a list of approved clones taken from selection work carried out by the IFV and INRA in connection with technical partners from different vineyards. The policy of the Catalogue and its objectives are registered in the Directive 68/193/EEC of the council amended. This text establishes that the Catalogue is the basis for monitoring and certifying material for the propagation of vines. It likewise stipulates that the principle morphological and physiological characteristics of varieties must be included and that only distinct, homogeneous and stable varieties can be admitted. The current varietal content of the French catalogue is defined by the ministerial decree of 18 April 2008, which distinguishes wine and table grapes to be used for canning, for accreditation and table grapes. The amending texts (at least 1 annually) are made to complete the catalogue upon the favorable instruction of new registration requests. The decree likewise classifies varieties, a notion referred to the Common Market Organization (CMO) for the vitivinicultural sector. Objectives include supporting production potential together with the qualitative improvement of products. The Council regulation, which defines the current CMO (number 479/2008), provides that only wine grape varieties are concerned with this classification. This classification is mandatory in each member state within its jurisdiction. Wine can only be produced from varieties admitted to the territory classification. Applications for entering old or new varieties in the Catalogue are reviewed by the Vigne du Comité Technique Permanent de Sélection (Vine Standing Technical Selection Committee) (CTPS). This consultative body is attached to the Ministry in charge of agriculture, gives an opinion on each dossier submitted. The CTPS vine section examines the dossiers in light of rules and criteria as defined in the specific technical regulations for vines, approved by a ministerial decree. Entry in the Catalogue require that a candidate variety must pass the "DHS" test. (distinct, homogeneous and stable), "VAT"» (agronomic and technological value), and the proposed denomination must be validated following a particular procedure, common to other species (old varieties are exempt). It is to be noted that inclusion in the Catalogue of a new variety does not ensure the protection of intellectual property attached to this granting. This step involves distinct procedures and competent authorities.